Monday was a long and wonderful day. I left the flat in Edinburgh at 06:30 UK time and fell into bed in the Bay Area about 26 hours later. But before I collapsed, FunkyPlaid took us straightaway to La Corneta in the Mission. I devoured a fantastic prawn taco and he mauled a burrito the size of a baby’s leg. 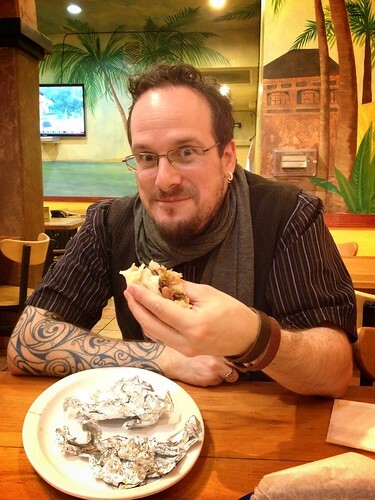 FunkyPlaid had waited for me to arrive before enjoying his first Mission burrito after a year away. Now that’s love!